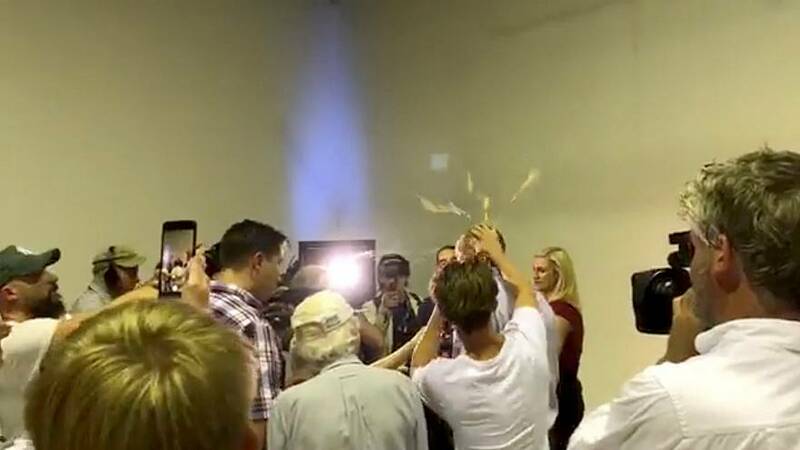 CANBERRA, Australia — Australia's prime minister has suggested an anti-Muslim senator should be charged after he hit a teen who cracked a raw egg over the legislator's head. .Police said the boy was arrested but was released without charge pending a further investigation. Police also said Anning "retaliated and struck the teen twice. "The government and opposition party agreed to pass a censure motion against Anning over his stance on the Christchurch shootings when Parliament resumes in April. Morrison said he denounced Anning's comments. "In his conflation of this horrendous terrorist attack with issues of immigration, in his attack on Islamic faith specifically — these comments are appalling and they're ugly and they have no place in Australia, in the Australian Parliament," Morrison said. "He should be, frankly, ashamed of himself." Immigration Minister David Coleman said Yiannopoulos' social media comments are "appalling and foment hatred and division. "Lawmakers within Australia's conservative government had been quarreling in recent weeks over whether Yiannopoulos should be allowed to tour Australia this year.